Family plot for the Gartrell family. Section A, Lot 690. The question arises when sitting beside the Lady in Black monument: Who else is buried with “Ank”? There are only three gravestones. 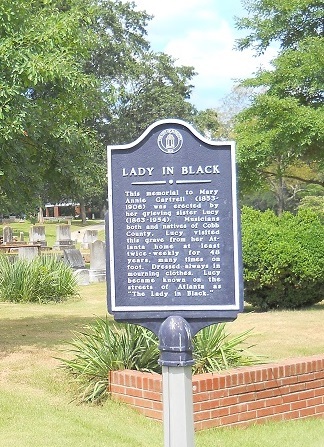 According to Names Recovered in the Old Portion of the Marietta City Cemetery, compiled and edited by David Eric Troemel, 1988, there is only one person buried here: Mary Annie (n.d.-5.9.1906). However, when I completed an online Find-a-Grave search on the Marietta City and Confederate Cemetery database I was surprised to find: Col. John Oswell Gartrell (6.11.1823-11.19-1911), Mary Annie Randle Gartrell (1.6.1829-5.24-1885), John Leonidas (n.d. @1858-6.10.1892), Mary Annie (n.d. [2.1862]-1906), Lucy (@1863-1954), and Ina Mae Gartrell Smith (1873-1953).